A vast array of expanded content, greater customization options, and additional story lines are available on the Xbox® video game system in Fable®: The Lost Chapters™. The massive original world and exciting main missions from the award-winning role-playing adventure Fable® return with further regions to explore, additional side quests to discover, and new missions to conquer. 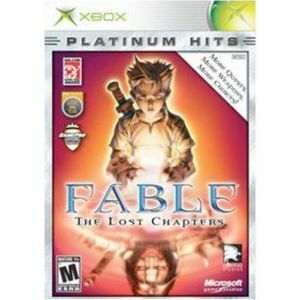 Fable: The Lost Chapters comes packed with all-new weapons, armor, spells, and quests that shape the hero you grow into. In this groundbreaking game from Lionhead Studios, your every action determines your character's skills, appearance, and morality. Create your character's life story, from childhood through adulthood and on to old age. As additional story and side quests await, choose the path of righteousness or dedicate your life to evil, and see yourself transform into a reflection of your actions and decisions. Age leaves you wizened and battle leaves you scarred as you explore the world of Albion with new expanded and enhanced content. Fable: The Lost Chapters offers even more character customization choices that impact appearance. With experience comes advancement and physical change. And as you develop your alter ego, the world reacts to you and your actions. The opinions of Albion's denizens are expressed through applause, mockery, trepidation, panic, and even flirtation. Each person you aid, each flower you crush, each creature you slay, changes the world forever. In Fable: The Lost Chapters, you decide: Who will I be? Experience expanded content: Explore the original worlds and core missions of Fable and discover additional regions, story lines, and side quests, as well as optional missions. 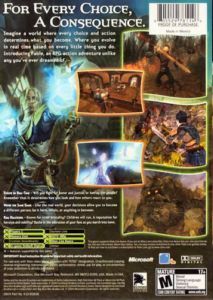 Fable: The Lost Chapters also gives you the chance to fight new monsters, practice an expanded group of spells, don new armor, wield additional weapons, and interact with friends and foes using new expressions. Forge a hero based on actions: Heroes age and evolve through the actions you choose and the paths you follow—for good, evil, or in between. Follow the way of the sword and see your muscles bulge, weave the dark arts and witness power crackling at your fingertips, or rely on speed and stealth to develop lightning-like reflexes and eagle-eyed accuracy. Engage in intense real-time combat: Collect battle scars as you duel with cunning foes and deadly creatures. Master an array of deadly weapons as you hone the art of blade-craft, hunt your quarry using subterfuge and stealth, or weave death from the elements as you harness the dark arts of the arcane. Build a living legend: Through deeds and actions, Fable: The Lost Chapters lets you build a name for your character across the land. Recruit allies and followers, gain glory or notoriety, and make friends and enemies—all while interacting with a living world of people, places, and events that react to you. Shape and explore a living, evolving world: Champion or manipulate an ever-changing land with competitive and cooperative heroes, dynamic weather systems, and environments teeming with cultures, creatures, citizens, and cities. Use scores of unique skills and extras: Learn new abilities and add possessions as your character develops. Master the art of thievery; acquire a family, real estate, clothing, or tattoos; and more. Fable: The Lost Chapters expands these offerings, providing you with even more customization choices. Never play the same game twice: Once an adventure has been completed, you can forge a new tale full of unexpected twists and turns, with new skills, powers, influences, allies, and enemies.